Funeral services will be held Friday at an 11:00 AM Mass of Christian Burial in the Sts. Peter & Paul Catholic Church in Scott for Mr. John Allen Prejean, age 82, who passed away at his residence in Scott Monday, January 7, 2019. Entombment will be in the church mausoleum. Mr. Prejean was a native and lifelong resident of rural Scott, LA, graduating as Salutatorian from Scott High School in the Class of 1955. He received his Bachelor of Arts Degree(1958) and Master ?30 Degree(1962) from the University of Southwestern Louisiana. He proudly served his country for ten years in the Louisiana National Guard, 156th Infantry Division-Medical Company. A member of Sts. 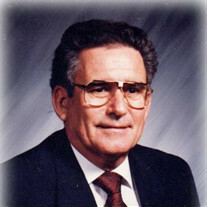 Peter & Paul Catholic Community, Mr. Prejean was a Trustee, a charter lector and lifetime member of the Holy Name Society, serving the church parish for sixty plus years. Mr. Prejean received the Bishop's Service Award in 2018. He was a former Knights of Columbus Third and Fourth Degree. To send flowers or a memorial gift to the family of John Allen Prejean please visit our Sympathy Store. It was a pleasure to work with John Allen in the Student Teaching Program at the university. One could not visit with him for very long and not sense his dedication to all phases of education. It was especially rewarding when some of our children who were educators were able to work with him in various capacities. Please click here for the Recognition Program for the College of Education Academic Showcase on Nov. 14, 1998. John Allen is one of the Centennial Honorees and his entry in included in the alphabetical listing of the honorees. Click here for the College of Education Academic Showcase page in the University Digital Archives, then select either the video page for oral histories or the Book of Letters.